This design for this ring was inspired by the patterns in sand under water at low tide with sunlight reflected from the ripples. The shallow formed silver dish is etched and satin finished with gold leaf inlayed. 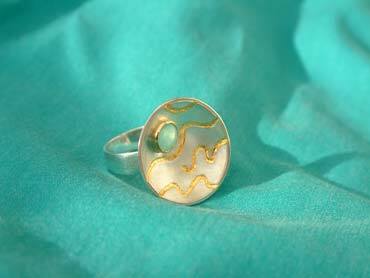 The milky, sea-coloured jade opal is set in a gold bezel with an open back. The reverse side of the dish and the simple band are high polished.